Inspired by David Keil’s fantastic workshop last meeting on the plants of the Morro Bay tidal marsh, I decided to do some exploration there, armed with his excellent identification key. 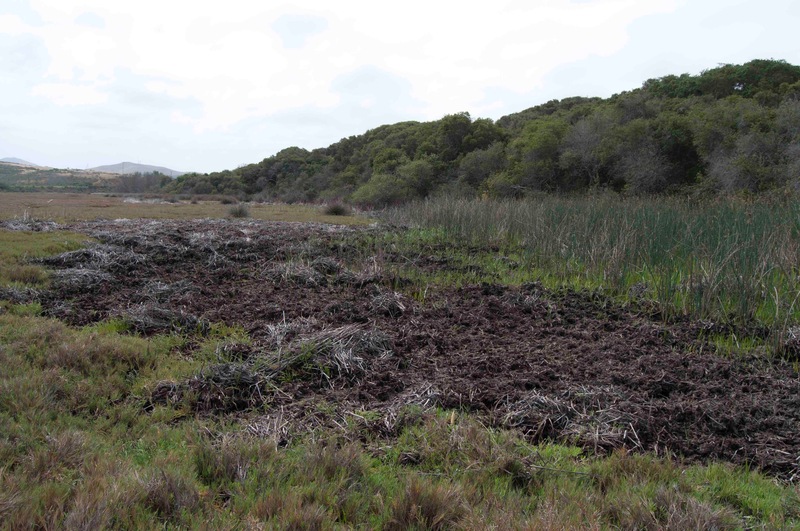 I ran into a conservation issue that I did not expect to see in a salt marsh … massive damage by pigs rooting in the rushes at the edge of the pickleweed, presumably for the roots of the rushes [photo below]. I have no idea how long it will take this mess to mend itself, but it is happening on both sides of the tidal channel east of the South Bay Boulevard bridge. I did not find any damage west of the bridge, although it appears that the drought has shut down a lot of the freshwater flow coming out of the dunes onto the marsh. well field, but who knows… just seems like a strange move in this time of extreme drought. The Atascadero subbasin drains right into that most critically at-risk basin, the main LOS III Paso Robles Basin. The conservation committee can only react to issues brought to its attention, so if you see something in your local area, let us know as we don’t follow some of the local governments very closely. Over the past 10 years Michael Kauffmann has explored most of the mountain ranges in the West with a particular focus on the Klamath Mountains. In his explorations, he has worked to better understand the region’s ecology through the eyes of conifers—one of the Earth’s oldest lineages of plants. California, Oregon and Washington nurture one of the richest assemblage of conifers in the world and Michael’s books Conifer Country and Conifers of the Pacific Slope help define their ecology and biogeography. Join Michael for an arm-chair journey into the Klamath Mountains and beyond—where we will explore ancient plants that survive in the West’s most exhilarating landscapes. Michael Kauffmann has a MA in Biology from Humboldt State University and is an educator at the elementary through college level. He has written three books, including co-authoring the just-released Field Guide to Manzanitas. He has lives in Kneeland, California with his wife Allison and son Sylas and in his free time enjoys backpacking, photography and plant exploring. Michael’s books will be available at the talk. The next Chapter meeting is the October “Dessert Potluck,” Thursday, October 1, 2015. Bring a dessert and photos and videos of your summer travels to share. With the successful creation of the rare-plant working group during the past few months, I would like to suggest our chapter broaden its horizons a bit more by assembling a horticulture working group. I bring this point up because CNPS is one of a very few organizations that can speak from expertise and confidence about how to successfully manage a landscape during an extended water crisis. Most of us are willing to admit now, Californians must move away from growing exotic, over-irrigated lawns and gardens, and embrace the fact that low water, sustainable landscapes are the only viable alternative. We have already seen this transition towards low-water plantings in our neighborhoods. California gardens are on the move! We all know our local green spaces and environs can become more ecology-friendly when local native plants are placed in and around our homes and cities. With this commitment by our local chapter to support the transition to native plants, we can utilize the abundant resources available in this area. These include those who garden with natives already, those who raise and sell natives to the public, those who work in environmental management and habitat restoration, as well as those studying botany, ornamental horticulture, and landscape architecture at local colleges. Thus, I am asking anyone with a knack for gardening and/or serious landscape experience to contact me by e-mail. With a dozen or so volunteers, we can put together a strong working group. Then branch out to communities in our area by extending a hand of support and guidance. Does the Endangered Species Act Help Recover Listed Plant Species? The federal ESA is one of our premier environmental laws, but are our plants any better off? 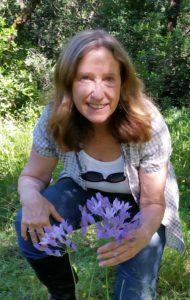 Using examples of listed plant species from the central coast counties, Connie will talk about some of the progress that has been made, as well as the setbacks that have been encountered along the way, in furthering conservation and recovery efforts. 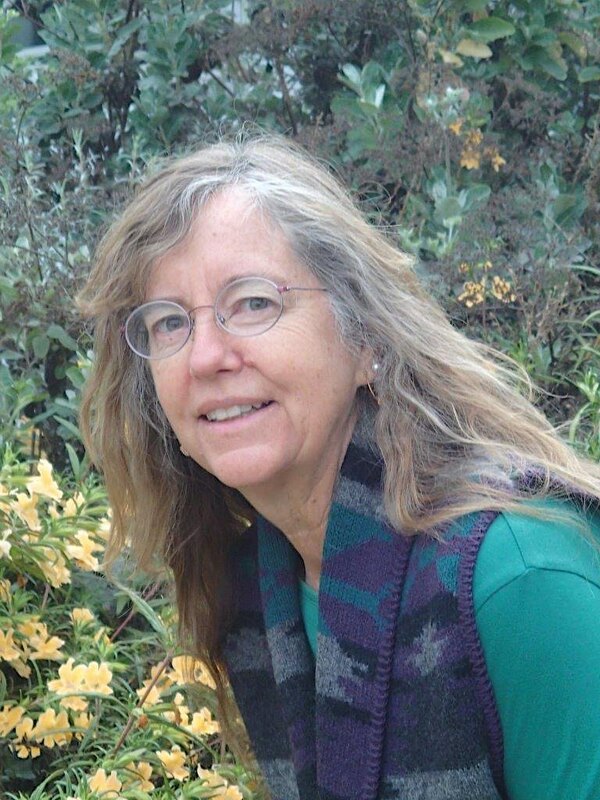 Connie Rutherford is Listing and Recovery Coordinator for the U.S. Fish and Wildlife Service’s Ventura-based office. She is an alumna of UC Santa Cruz and Humboldt State University, and spent several adventurous years in the field in Alaska, the Pacific northwest, Haiti, and the Mojave Desert before settling down in Ventura to a real job and family life. Early in her career, she worked to put a lot of plant species ON the list of endangered species; now she works to get them OFF. 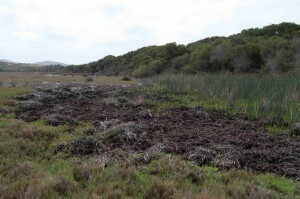 Pre-Meeting Workshop: At 6:15 p.m. Dave Keil will lead a workshop on identification of salt marsh plants before the meeting. Join us to visit one of the “hottest” spots for botanical diversity in San Luis Obispo Co. Our leader D.R. “Doc” Miller will take us to see many of the unique species located on the coastal bluffs. The Arroyo De La Cruz area features a variety of plant communities and a number of endemics, found only in this relatively small area, full of rare and endangered plants. Meet at the parking lot of Spencer’s Market in Morro Bay, 2650 Main Street, at 9:00 a.m. From there we will drive north with a brief stop at the Elephant Seal Overlook (9:30 a.m.), to pick up any participants form Cambria and the North County, and then proceed on to Arroyo De La Cruz site. The field trip will last about 3 hours. For more information, contact Bill Waycott, (805) 459-2103, bill.waycott@gmail.com. Sudden Oak Death (SOD), a serious exotic disease, is threatening the survival of tanoak and several oak species in California. Currently SOD is found in 14 coastal California counties, from Monterey to Humboldt. Researchers have discovered that Phytophthora ramorum, the pathogen that causes SOD, spreads most often on infected California bay laurel leaves. Some management options are available, but they are effective only if implemented before oaks and tanoaks are infected; hence, timely detection of the disease on bay laurel leaves is essential for a successful proactive attempt to slow down the SOD epidemic. This is a great opportunity to participate in a state-wide, very successful citizen science program. None of the samples collected in 2013 and 2014 were positive for SOD. But, it is very important to continue the monitoring to ensure this disease does not appear in SLO County or to manage the disease if we do get a positive result. The SOD-blitz is to inform and educate the community about the disease and its effects, get locals involved in detecting the disease, and produce detailed local maps of disease distribution. The map can then be used to identify those areas where the infestation may be mild enough to justify proactive management. A community meeting/training session held on a Friday evening; followed by collection of leaf samples by volunteers on Saturday and Sunday. We will provide a list of recommended areas for sampling at the meeting. • We will divide into groups for collecting. Ideally, one person in a group will have a GPS device or tablet or phone with GPS capability. Collecting – Saturday and Sunday, May 16 and 17 (Locations to be determined). All of the materials necessary for the training and the collecting over weekend will be provided. As I explained in last month’s newsletter, we didn’t expect to wring any more concessions from the County, and so that now a solar developer can take a 40 acre parcel and turn it to solar without an environmental impact report, just a biological study where CNPS will be notified of the project but, apparently, has no avenue through which to recommend changes without going through an expensive appeal process. We are still waiting the final EIR on the Arroyo Grande oilfield. There is massive public concern about exploding oil trains that is causing decisions on the Conoco-Phillips rail spur to be delayed. There are some disturbing projects being proposed that CNPS must watch with care about to enter the pipeline. Two of them are in the Avila area, with one being Wild Cherry Canyon on land that nearly got bought for State Parks, and a second as amendments to the San Luis Bay Estates Master Development Plan and General Plan that would allow development near the club house at the golf course. A map of the proposed San Luis Bay Estates plan shows it on a now grassy slope immediately north of the tennis courts and parking, which are both due north of the highway bridge. The same developer, Rob Rossi, is proposing about 100 single- family homes, a 100- to 120-room hotel, and about 50 retirement units near the Blacklake clubhouse (or possibly an estimated 110 to 130 residential homes, about 130 hotel rooms, 100 retirement units and 25 spaces for recreational vehicles as proposed to Nipomo Community Service District). Water demand in the Blacklake project would be mitigated through removal of golf greens. These days the main issue in any new development is demand for additional water, and this is of central interest to CNPS , where our primary interest would seem to be habitat conservation. Our interest lies in the increasing restrictions on application of water for horticulture, as native plant gardening is a central interest to our members. The drought is now placing native plant communities such as oak, Monterey pine, Morro manzanita and other species at great risk where the plants have been conserved in an urban setting. This is commonly a mitigation that allowed development in these plant communities, and the plants persist and young plants are recruited under “normal” rain conditions. We are now seeing massive die-off of young plants in areas that are never watered, and there are limitations on the amount of grey water that can be allocated to their salvation in the garden environment. Cambria residents should try to keep young pines alive so that the famous forest will persist, although the large older trees appear to be doomed in many parts of the forest where mortality rates are locally very high. What can you do to save water that would otherwise go down the drain? Plug the shower drain and scoop water into buckets to transport out to the yard. Save sink water, vegetable washing water in buckets at the sink. Smell worse? Do whatever needs to be done to keep those natives alive without pouring good drinking water on them. CNPS addressed the SLO County Planning Commission three times, and the Board of Supervisors once regarding plans to change local zoning to allow solar and wind projects to be ‘fast-tracked’. As a result it seems CNPS will be notified when a project enters the fast track system, and in a surprise move, County said it let us look at botanic reports. We also got the maximum acreage to be considered by a ministerial position to be reduced from 160 acres to 40 acres. How much of this will stick when the Board of Supervisors make a decision on March 24th, but I don’t expect to get much more in the way of concessions. As I stated last month, CNPS is strongly for alternative energy, but just want to avoid needless destruction of valuable habitat in the process. We had requested that the requirement that land be “disturbed” before entering Fast Track be extended to 40 acres rather than the current cap of 20 acres. CNPS has been hanging out all on its lonesome in this issue, so there does not be much political pressure to give us what we want. Given that CNPS, upon being notified about a project, could warn of the potential presence of rare plants, we are going to try to locate the positions of all plants of CEQA significance that may exist in herbarium records. That way, when we are notified, we can make an intelligent response. The results of our membership survey are now available for review. Interestingly, the topic that received the most responses by far was plant lists for popular trails and local parks. There was a group of topics that clustered in the middle. These included: trainings to identify rare, invasive, medicinal and edible plants and the milkweed project, followed by public native gardens and plant conservation projects. Now that we are clear about our preferences, we will continue to plan for the engagement of our membership in related activities. With regard to plant lists, a number of these lists exist in a semi-finished form. Going forward, we will create groups of volunteers to review and verify the lists by walking the trails and taking inventories. Dr. David Keil or Cal Poly University has agreed to keep the lists updated and monitor them for accuracy. Regarding plant identification training, we have a strong relationship with the Rare Plant Program statewide. The coordinator for the Rare Plant Treasure Hunts, Danny Slakey has presented two training sessions for our chapter in the past four months. 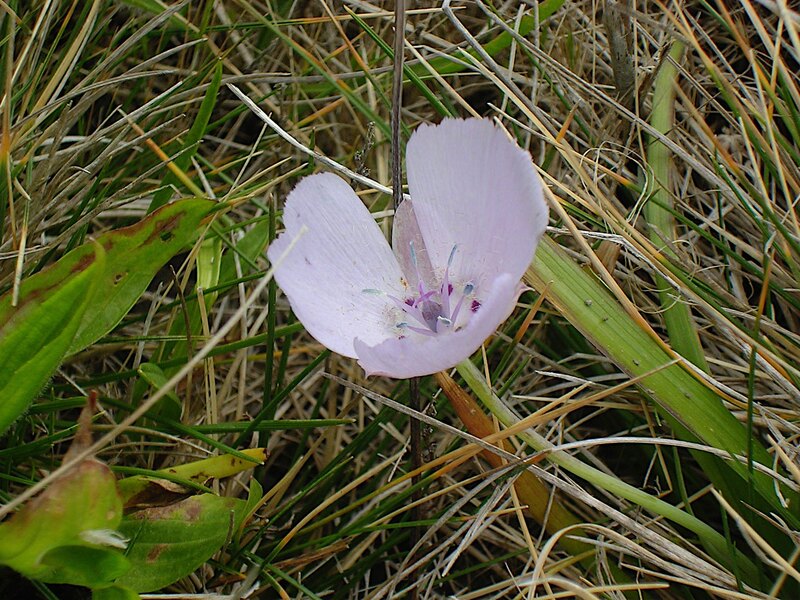 A group of volunteers is now forming to help monitor and describe rare plant populations in the central coast region. 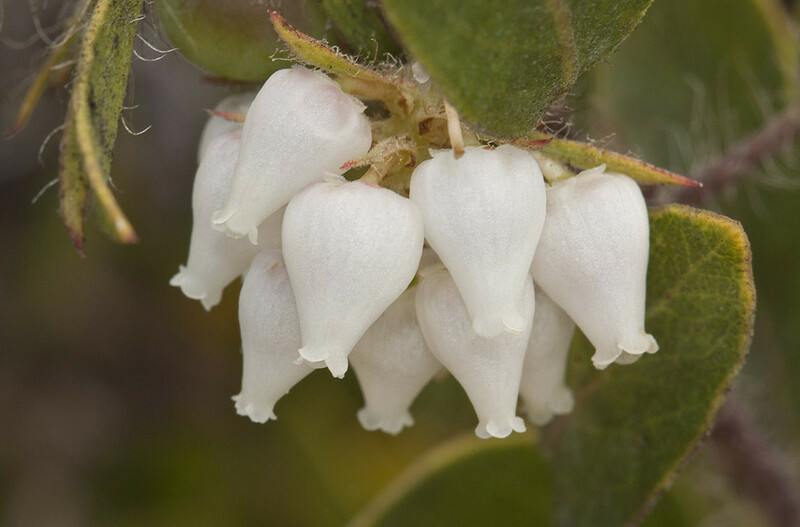 Interest in invasive plant ID and eradication has been brought to the attention of CNPS by local governmental agencies and will be developed later this year. Members interested in working with these agencies will be trained to assist in field identification and control. 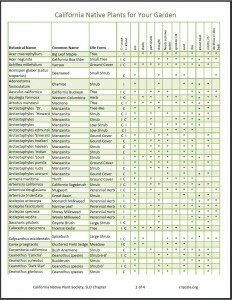 As far as public native gardens and the milkweed project go, a number of our members are already active in these areas. With the drought continuing for another year and the monarch butterflies under attack, CNPS will bolster these efforts as we participate in demonstration gardens and exhibits by advocating the numerous benefits of diverse native plant landscapes. Lastly, our chapter will continue its efforts to monitor land development projects in our region to insure adequate environmental review. CNPS has vast resources that can be utilized when assessing potential land development and disturbance. Volunteers will be needed to work with our conservation committee to thoroughly vet projects prior to approval and to voice their opinions when these project come up for public comment.